A traditional example of what a Pale Ale was, but an example of how a Pale Ale hasn’t evolved with current Tastes and Trends. The Good: This Pale Ale is definitely sharper on the taste buds that what I typically expect from a Pale Ale. For the first beer of the evening it was enough to awaken the taste buds, satisfying and quenching the thirst with ease. The Bad: With quite a few Pale Ale’s now reviewed on Suburban Brewing, the scents and flavours that we are usually accustomed to just did not come through. In fact the scent I get from this smells more like a lager or session ale than a Pale Ale. Even for your mass produced Pale Ales like Fat Yak or Wild Yak or even Little Creatures, there is definitely more of a Pale Ale “vibe” to those beers than there is to the Yenda Pale Ale. I mean the beer tastes fine and perhaps it is the evolution of what a Pale Ale has become recognised for that has changed, but considering what we have come to expect as a Pale Ale I must admit this was not it. Enjoyment: To be completely blunt this Pale Ale is one that I would skip next time I am at the bottle shop. To me a good Pale Ale is a staple of what a brewery can do and the Australian Beer Company missed the mark on this one, it tastes like mass produced average beer and not the carefully perfected recipe of a good pale ale that we come to expect from a smaller micro brewery. That being said there are numerous beers that are mass produced that I am a big fan of (Sierra Nevada to name just one), the difference is that the combination of flavours and scents mixed with the sustained duration that a beer has on your tastebuds all makes an impact. The Good: Man oh man was the a pleasant surprise. Coming off of the back of the Yenda Session Lager I did not have much faith in this particular lager, but damn was I sorely mistaken. This beer has a lot more bite to it than I was expecting, tantalising the tastebuds with some extra flavour after another day labouring in the backyard (crafting the perfect beer garden takes time and a lot of hard labour!). The hops are not that intense however the barley and malt that is used takes off some of the bite that you may expect making it a delightful almost creamy taste to it. The Bad: It suffers the same fate as the Session Lager in the sense that it doesn't elicit any stronger feelings as you finish the bottle. To be brutally honest the last mouthful whilst a much better mouthful than the Session Lager, didn’t really do much for me. It remained consistent but towards the end felt too carbonated or heavy for a drink that is only rated to 1.1 standard drinks. Enjoyment: I categorise this in the same boat as I would a lot of Lagers, that is they are great to start with but never finish with them. What I mean is if you have worked a full day and just need a beer to relax with then the Yenda Crisp Lager will hit the spot every time. That being said it is not the sort of beer that I would want to do a full session on, its carbonation would hit you before the alcohol hit you and depending on what you are looking for that is not a good thing. This Session Lager is an easy to drink beer but misses the mark when it comes to flavour and longevity. The Good: Yenda Session Lager is an interesting title for a lager and I say this particularly because of the use of “session” in the title. 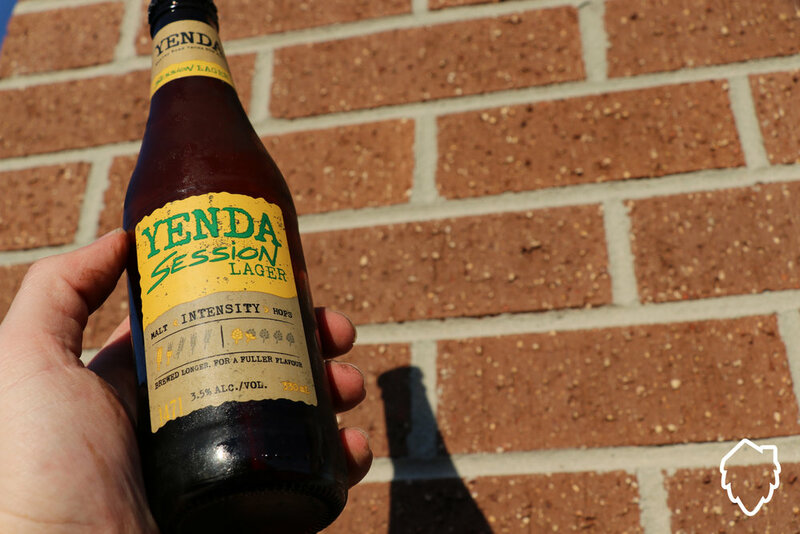 By there very definition of how I rate a session beer it has to be the sort of beer that is easy to drink relatively quickly and in big mouthfuls, Yenda Session Lager definitely lives up to this title. After a long day of working in the sun this beer went down like water, needless to say it was delightful. The Bad: This beer is far too watery for my liking, so much so that it almost washes away the flavours that you want to taste when drinking a good lager. That being said it is not a strong beer at all, so whilst it doesn't really hit the mark for me, for someone starting to drink beers it may be a good starting point. Enjoyment: I gotta admit I am 50/50 on this one, after a long day of manual labour in the sun, a sore back and sunburnt face this beer was like liquid gold. However as I neared the end I became disenchanted with it, looking for the flavours that I usually like to taste in a good Lager (Dos Blockos comes to mind as a personal favourite). For me this is a good beer to smash when you are thirsty and in need of a beer, however it is not the sort of beer that I would like to drink consistently over a session (i.e. one after the other).